To get the Tri color, a recessive piebald gene was present in both dogs combined making the dominant gene. His tri -colored yorkie was born from two traditonal champion yorkshire terriers. 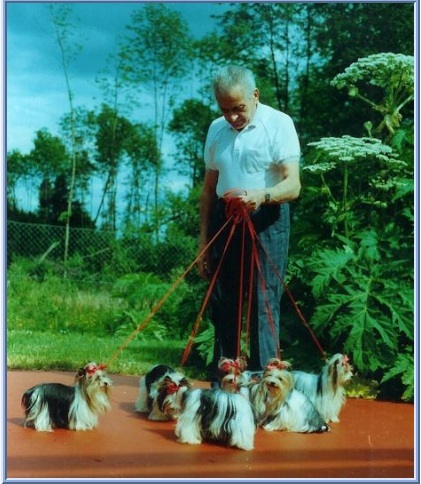 Mr. Biewer continued to breed for the tri-colored Yorkshire Terriers. From here he line bred/inbred to keep producing the Parti/Tri- colored Yorkshire Terrier. The tri color yorkies at first were registered in VDH/KFT, but They designated them as being of ?wrong color, not for breeding " KFT would register the tri-colors as long as they came from VDH/KFT registered Yorkies but if they were tri-colored the papers were marked as "Not For Breeding" So any of the offspring could not be registered. It is said Mr. Biewer then began his search for a registry that would accept his Tri color Yorkies. The ACH (Allgemeiner Club der Hundefreunde Deutschland ) was the only club to accept them as a Biewer Yorkshire Terrier . AT first they called them the German Yorkshire Terrier but then changed it. In 1986 The dogs were officially registered as Biewer Yorkshire a la Pom Pon. Mr Biewer bred Darling von Friedheck to Fru Fru Von Friedheck and on January 20, 1984 a beautiful tri colored Yorkshire Terrier was born, He named her Schneeflockchen Von Friedheck. On 05/23/2003 Dagmar Pryzstaw and Daniela Braun opened the 1. Deutsche Biewer Club, But after some time Dagmar Pryzstaw left the 1.Deutsche Biewer club because of conflicts with Daniela Braun. In September of 2004 Dagmar opened 2 new Biewer Clubs, the1.Deutscher Biewer Club and the International Biewer Club ( IBC )It has been said by some of the American Biewer Clubs that Mr. Biewer never bred back to the traditional yorkie, That is another Myth. Mr Biewer bred Darling to several of his tri color females. He bred Darling to Grand Pom Pon to get Schneerose and he bred Darling to Schneeflokchen to get Schneewitten, and even as late as 1992 he was breeding to traditional color yorkies when he bred Schneewirbel von Friedheck(tri) to Janny von Friedheck(a blue and tan yorkie) to produce SCHNEE-MONSIEUR VON FRIEDHECK just to name a few. 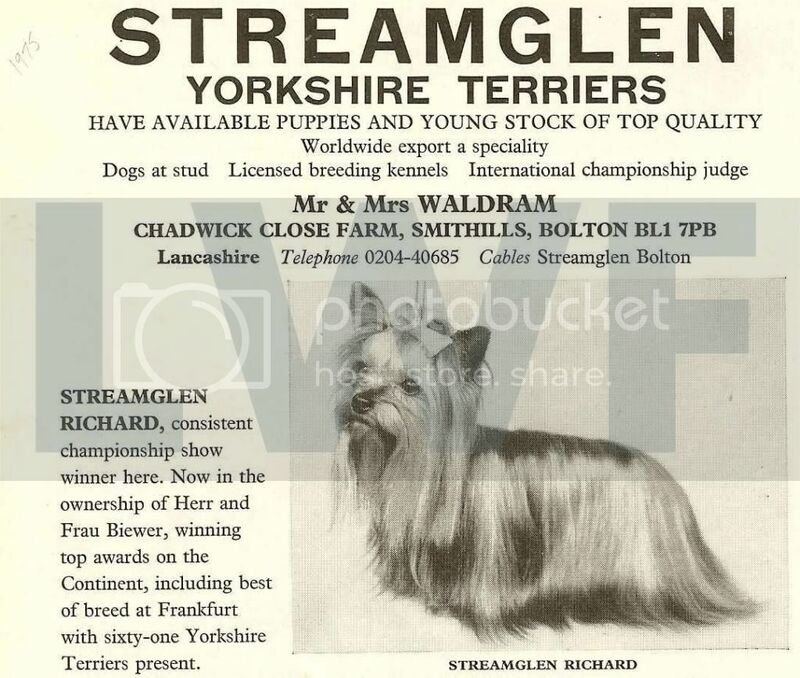 After his death when some breeders in the USA started importing the Biewer Yorkshire A la Pom Pon and soon after Mr. Biewers line of yorkies were at first called yorkies then gradually changed to a cousin of the yorkie. They have changed its name and some have even changed the standard from which Mr Biewer set. Most of the Biewer Clubs in the United States believe in breeding only Biewer to Biewer, they say to keep the breed pure, Well, yes it does keep the breed pure because what they are doing is line-breeding, breeding a tri-color yorkie to a tri-color yorkie to produce tri-color yorkies. That is what Mr. Biewer did, He bred his tri colors to each other to get tri's. All are Yorkshire Terriers. The history of where the Biewer begins is extremely important and should never be disregarded, shoved under the rug or just plain ignored as some of the Biewer clubs are doing. You cannot just go back to certain dogs like Fru Fru and Darling and say the history started there. There were more dogs involved in the path that Mr Biewer took to get his tri colors other than Fru Fru and Darling. What genetic pool did Mr. Biewer use when developing this tri color dog? If the entire gene pool consisted of Yorkies with non standard colors and markings, then the end result would still have to be a Yorkie whatever the coloration. Being born another color(out of standard)of a breed does NOT make it a new breed. Why weren't the other Yorkie breeders producing these white and black dogs in volumes? Did it appear that the Biewer's had all the Yorkies that carried that elusive piebald gene? A:Breeders didn't want to produce them, they culled any color produced except the standard color. Still do to this day. If you are going to reference Joan Gordon's one incident, out of her decades of breeding, well, that statement in itself speaks volumes. Yes, they had one and she said that was the only one they ever had born. What does that prove. There were lots of other lines producing tri colors. Many in Germany and other countries do not practice the breeding of only Biewer to Biewer, they allow the traditional color yorkies to be bred into the lines. Germany admitted that they did not have enough unrelated and healthy biewer lines. If Germany feels they didn't have enough lines to breed only Biewer to Biewer, why do the american breeders feel they have enough unrelated and healthy lines? You have the same lines as the german breeders. In Germany some health issues in the Biewers popped up, that came from all the inbreeding of Biewer to Biewer with not enough unrelated and healthy Biewer lines. More and more breeders in Germany no longer breed the Biewer, because of the health issues. And more and more german breeders that are still breeding, feel it is necessary to breed their Biewers back to the yorkshire terrier (and they do). They feel the Biewer is a Yorkshire Terrier, only the color makes the difference. It is said that Mr Biewer wanted recognition that the Biewer is a tricolored Yorkshire Terrier. 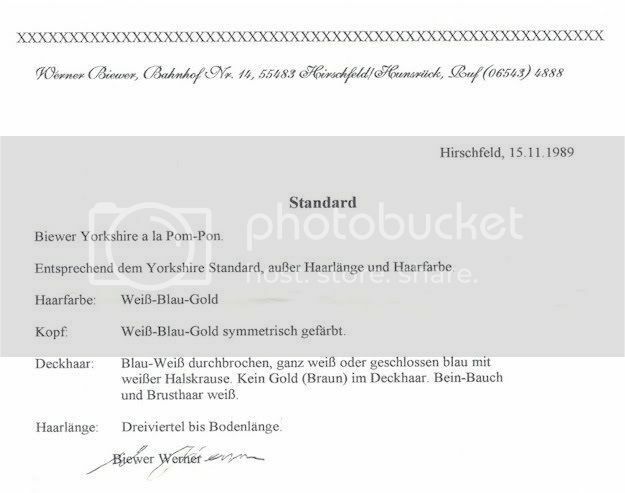 That was the reason he left the VDH. . That was the reason he set the standard from the "Yorkshire Terrier" , he only included the special color of the biewer. It is only a Biewer if the puppy is born tri color, the ones born traditional colors are considered yorkie splitters. So you can have both traditional and Biewer puppies born in the same litter but registered 2 different ways because of the color. Now German Yorkies come in chocolates, reds, golds and creams. All colors that have been in the Yorkie for years. Breeders of these dogs are making new breeds of them. These names describe the color of the dog not the breed. So in a litter of puppies you can have 5 separate breeds depending on the color they come out? I think not. Are they separate breeds from each other? If a Biewer is bred with a Golddust and both are carriers of chocolate and the puppy comes out chocolate, How do you register it? Is it registered as a Yorkshire Terrier or a Biro Biewer? It is much too complicated, so lets all call them what they are, "Yorkshire Terriers." IF you plan on buying a Biewer, do alot of research first. I would recommend buying one that has outside lines bred into it and is not a 3, 4 or 5+ generation Biewer to Biewer breeding. Some of the Biewers have shown up with liver shunts, seizures some other health problems. The Biewer is a line of yorkies (Like the Durrer or Wildweir lines) that a man in Germany bred and called them after his own name. Mr. Biewer did in Germany that which is not accepted in the USA. He took a purebred Yorkshire terrier and gave it a new name, registered in a new club so that they could be registered, bred and shown. As AKC states:The FSS® is not open to "rare" breeds that are a variation of an AKC-registrable breed or the result of a combination of two AKC-recognized breeds. This includes and is not limited to differences such as size (over and under), coat type, coat colors, and coat colors and/or types that are disqualifications from Conformation. For the Biewer terrier club to get the biewer into FSS with AKC they had to say they were a mix breed and not a yorkshire terrier. 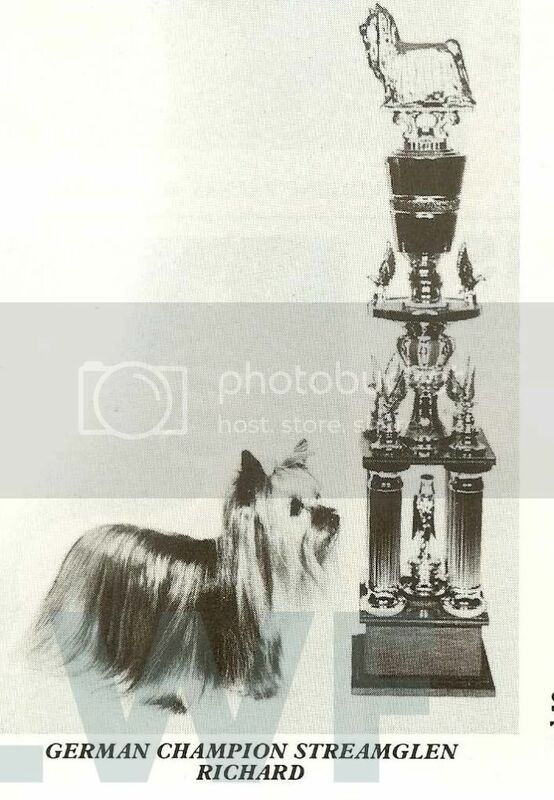 On December 10, 1976( 8 Years before Mr. Biewers tri color) Joan Gordon and Janet Bennet had a tri color puppy born into their Champion Kennel (Wildweir) from their line.. They decided to keep him and not put him down. They did register him with AKC, but as black and tan because AKC had no tri color classifications at that time. "Trippy" lived to be 12 years old. Joan said at the time Trippy was born quote " She had heard of tri's being born in England and that the tri-color yorkie was imported into Germany from English stock"
What you can see that in 1984 when Mr Biewers Tri color yorkie was born, it was not a new breed nor a cross breed. It was a tri-colored Yorkie born from 2 traditional colored Jr champion Yorkies the result of 2 parents carrying recessively for the Piebald gene and instead of putting this mismarked puppy down he decided to inbreed and linebreed for more. Just because your breeding Biewer to Biewer does not make them another breed they are still yorkies they came from 2 yorkies and if no other breed has been added they are still yorkies and as long as you breed them to each other they will always be yorkies. Yorkies of a different color but never the less they are Yorkshire Terriers. By only allowing Biewer to Biewer breeding (1) You are closing your sources and only allowing for line breeding (2)you are isolating the piebald gene and soon they will become washed out, more and more white will appear in the years to come.. I see more and more showing up with white heads and split faces already, including the AKC Parti yorkies. The more you breed tri color to tri color the lighter they will get. That is why I feel it is extremely important to breed traditional colors back into your lines, Therefore keeping the colors alive and vibrant and not washed out. Some of the AKC Parti Yorkies have been inbred too, It is not just the Biewers. Before you buy check the pedigree. The parti Yorkie has a much much wider gene pool to breed from because they are AKC registered yorkshire terriers, where as most of the Biewer clubs believe in only Biewer to Biewer breedings. Linebreeding is a form of inbreeding practiced by some animal breeders to "fix" desirable traits in a breed of animal, without as high a risk of producing undesirable traits that may occur with close inbreeding. A typical example of linebreeding would be what in human parlance would be considered a mating of first cousins or more distantly related individuals who share a common ancestor. While linebreeding is less likely to cause problems in the first generation than does inbreeding, over time, linebreeding can reduce the genetic diversity of a population and cause problems related to a too-small genepool that may include an increased prevalence of genetic disorders and inbreeding depression. Think of it like this ? if your family only bred with cousins, uncles, aunts, sisters, brothers, grandparents and yes even mother to son and father to daughter ,the genetic gene pool would become very narrow. Yes, you would all resemble each other but your sickness and disease would increase by tapping into the same genetic pool. Most people only look at the first 3 generations of a pedigree and think they are not related. What one must do is look deeper. Below is the typical Biewer Pedigree, This is the reason that some Germans breeds back to the yorkie. The Biewer Clubs in the U.S. promoting only Biewer to Biewer are still breeding these dogs with no outside lines.